Aghaboe Abbey was founded in the sixth century by St. Canice. The abbey grew into a major centre of learning, commerce and agriculture. The astronomer St. Virgilius, also known as St. Feargal, was its abbot in the 700s before he left Ireland, going on to become Bishop of Salzburg. After the original monastery burned in 1234, it was rebuilt as an Augustinian priory. Today a Church of Ireland, which dates from the 1700s, stands where that priory once stood. This church appears to contain some fragments of the Augustinians’ buildings. On the east side of the doorway, visitors can see a carved limestone head that dates from the Middle Ages. The small belltower at the northwest corner of the church has the same proportions as one from the 1200s. The fine ruins on this site belong to a Dominican friary founded in 1382 by Finghan MacGillapatrick, Lord of Ossory. The church, which was conserved by the local community, contains a beautifully carved three-light window in the east wall. Monks would have entered through the doorway in the north wall, which led from the cloister. The doorway in the west wall, through which the public would have entered the church, dates from the Middle Ages. Near Aghaboe Abbey the tree-covered remains of a Norman motte can be seen. The Normans would have built a wooden tower on top of this steep-sided mound of earth, where they could store their arms and from which they could keep a lookout for potential attackers. 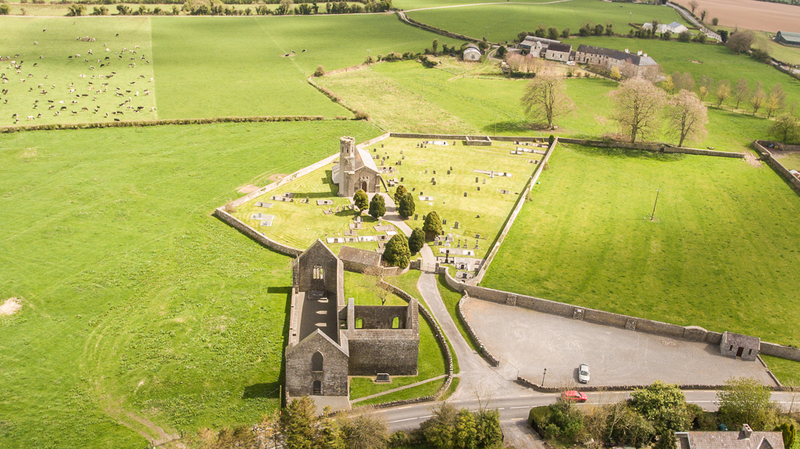 This audioguide to Aghaboe is also available in Irish, French, German, Italian, Spanish and Mandarin, as part of an Ireland’s Ancient East Project, funded by Fáilte Ireland.